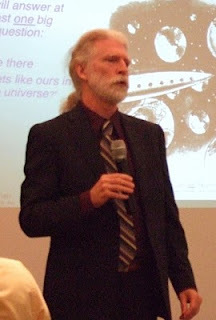 As promised, the full length interview with Steve Howell from NOAO and the Kepler mission is now online at Slacker Astronomy dot org. The Kepler mission is designed to discover Earth-like planets around other stars. The Kepler space telescope will stare at a field bordering Cygnus and Lyra for three to five years, continuously monitoring over 150,000 stars for exoplanet transits. According to a recent paper from Howell and collaborators, Kepler should also be able to detect asteroids orbiting white dwarfs. And just for fun, Steve and I talk about the long lost astrological sign Ophiuchus.